Gizmodo published some interesting pieces this week about Microsoft's new tablet, the Courier. This product appears very much rooted in Microsoft's traditional tablet computer space with a pen but also incorporates some interesting touch features. Frankly, some of them are so close to the iPhone gestures that I wonder if there won't be a patent fight. Regardless, I'm glad to see Microsoft getting in the space. It looks like an innovative device but I'm not sure how well hinging two screens together is going to work in the long run. I suspect Apple's eventual entry will be quite different. Frankly, if someone brought a hinged iBook tablet thingy in Steve Jobs' office, he would probably leave with it lodged in certain unmentionable places. The good news is there appears to be a lot of innovation around computing lately and that can only be a good thing. 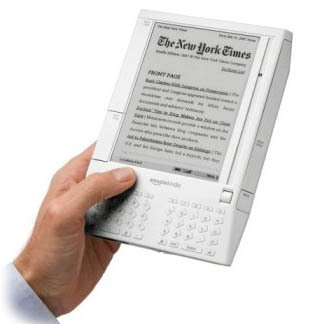 There is a lot of hubbub on the internet lately about these document reader devices. Sony has one and now Amazaon is pushing its "Kindle" which also is supposed to do the trick. 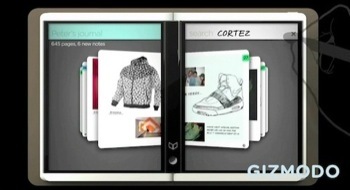 The idea behind them is to replace your books with an electronic device that displays as well as the printed page. So you can be sitting on your couch or in a coffee shop and read newspapers, blogs, books, or anything else that strikes your fancy. In principle, I think this is a great idea. However, I don't think the existing products are there yet. Let me explain. I like books. I like their heft. I like the texture of the paper under my fingers. I like rifling through a book with my thumb to find a particular passage. But when I read a book, I don't just "read" it. For me it is a more interactive process. I put checks in margins, underline passages, dog ear pages, draw lines and arrows in the margin, and tear pages out of magazines. I even sometimes argue with the author in the margin. This is usually with non-fiction reading but I've been known to rant with fictional characters as well. That is right, I am a librarian's worst nightmare. 1. The display must be friendly to the eyes. Really! Screen technology is improving every day. But if I am going to spend three hours reading a screen, it needs to be perfect. I saw the Sony reader in a store and it actually looked pretty nice. For 10 minutes. I don't know how it would feel after hours. I added the letters "PDF" during the edit of this story. Because I can think of no other way to pull this off. Any system that requires me to wait on Amazon, Apple, Sony or any other corporate gang is not going to cut it. Whether I am reading a 1903 legal decision or an article on recent changes to Applescript, I want it in my electronic reader. Furthermore, I'm not sure I like the idea of everything having to be text. With the PDF format, you can have unique formatting, styles, and pretty pictures to boot. Using PDF's would also help solve the problem of dicey book DRM. As it stands with Amazon's reader, you pay $400 for the device, then $10 for a book, then $15 for a newspaper subscription. It is in a format that can only be read on that machine. Who is to say there will be anything that can read that file five years. On the other hand, I am looking forward to passing on my copy of Camus' "Myth of Sisyphus" to my daughter when she graduates high school. It is well worn, well annotated, and DRM free. Good luck with that one Amazon. Without annotation, I think this would be nothing more than a toy for me. Fun for reading fiction but useless for "work". I am open to ideas on this annotation but doubt anything can beat my current analog system consisting of a few pencils. This technology exists on current tablet based computers but that is really not good enough. The pixelation is horrendous and clunky. I've promised myself I will no longer purchase consumer electronics that look like they were designed by a monkey. Call this my Apple bias but it is not. I just like things that work well and were designed with idea of accommodating me more than some manufacturing equipment in Taiwan. The Sony reader looks stylish enough but it falls apart when it comes to features. The Amazon Kindle just strikes me as ugly. It reminds me more of my old Atari 800 computer more than anything designed in the 21st century. The things that I don't need in a reader are a bunch of internet bolt on applications. No email or productivity applications. Wifi would be nice for obtaining content but I am not even convinced I would need a browser. At least not a browser in the traditional sense. I would prefer a simple way to wirelessly sync content and annotation. As the technology gets smaller and cheaper we may find that the idea of a reader is simply a passing fancy. The 2007 equivalent of the personal jet pack. If anyone gets tablet computing right it could easily include these features with a few more. The advantage of a reader would, hopefully, be a lower price but with the increasing use of flash ram and better electronics, we may just leap frog the digital reader entirely and use tablet. So there you have it. Could a device like this exist in the near future? Sure. Does it exist? No. So it looks like I will just have to continue abusing books. For now.